Quest Diagnostics was seeking a technology that would streamline the patient check in process while providing the ability to better track the patient wait time and to provide a means to monitor and measure the workflow in real time at each of their patient service centers. Quest considers patient waiting time and the key measure of patient satisfaction. The VisMed CheckIn solution was deployed to provide a paperless interface between the patient and the Quest workflow process. 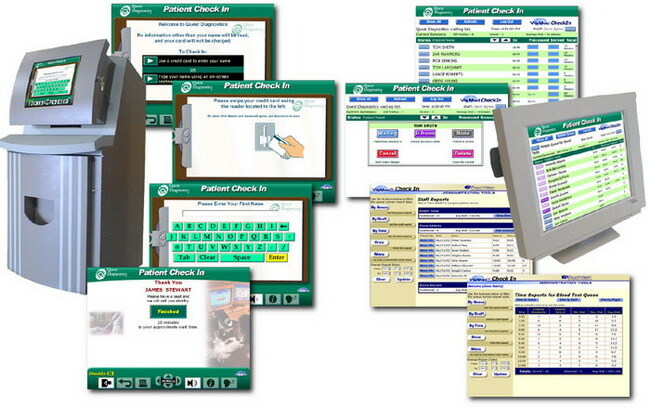 A patient check-in kiosk provides the first step in the process. The check-in kiosk completely replaces Quest’s existing paper-based check-in clipboard. As the patient enters a Quest service center, the patient is presented with the option of using any credit card or driver’s license as a convenient means to quickly capture their name and address. Or, the patient may use an easy-to-use touchscreen keyboard to enter in their name and optionally respond to a few simple questions. VisMed CheckIn computes and displays to the patient an estimated wait time based on a formula that takes into consideration the number of patients in the queue, the number of phlebotomists on duty and the current average wait time of patients served earlier. The patient information along with the check-in time and date is stored on a central database on a virtual private network. The lab administrative staff work with a wireless thin client touch screen that display a listing of the patients that are in the waiting room, those in the process of being served and those whose service has been completed. This screen is used to identify the next patient in the queue and to monitor average patient waiting times. As a phlebotomist is available to serve the next patient in the queue, the staff touches a button on the screen to assign the patient to the phlebotomist. When the phlebotomist has finished serving the patient, the phlebotomist touches another touch screen display located in the drawing room to indicate the completion of the process for that patient.